Is it cheating to buy yarn for a pooling project that’s “pre-pooled”? Next I have to dress the loom and get all those colour sections to align again… wish me luck! I think it was inevitable. The moment I decided to re-acquaint myself with all the weaving info I accrued in the first crazy months of my passion (obsession? ), I fell head-first into what a weaver friend of mine calls wanting to weave ALL THE THINGS. This is true: About 5 minutes into remembering why I have separate folders for ‘patterns’, ‘drafts’, ‘ideas’ and ‘techniques’ I was already planning about seven scarves. Then, of course it’s xmas and everything is on sale, so I bought yarn. I have cupboards full of yarn. I did not need any more yarn. But… I didn’t feel I had the right yarn for the first thing I believe I’m going to weave just as soon as I give the craftroom a really, really thorough vacuuming. Yes well. Good thing was (aside from getting 20% off) that I only bought two skeins and that’ll do for this new project. Of course it does mean that I now absolutely have to weave this project first, to justify buying the new yarn. Hmm… Have to love the way the brain works, don’t you? 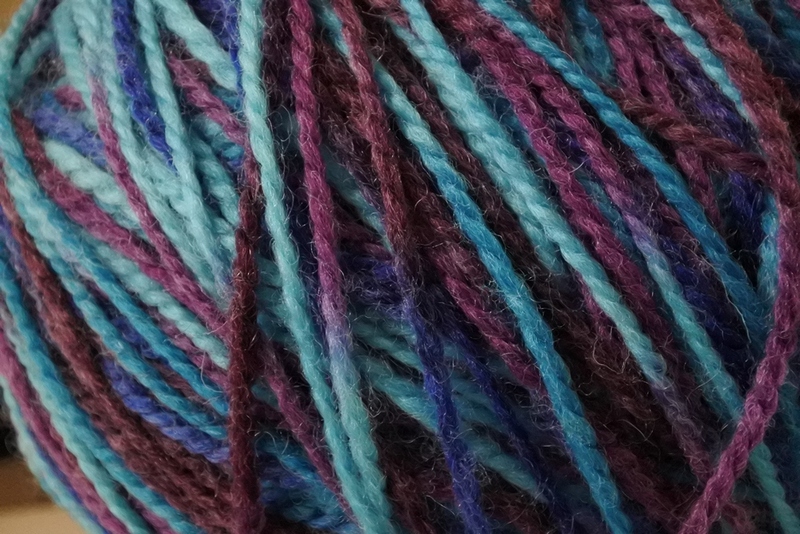 Anyway, the yarn is Manos del Uruguay, Clasica 12 ply in a lovely blue and mauve vari and a natural cream/white. And what will be the fate of this lovely yarn? You’ll have to wait and see. It’s a bit of an experiment, so it could all go very badly, but I suspect it’ll be an attractive ruin even if it does! 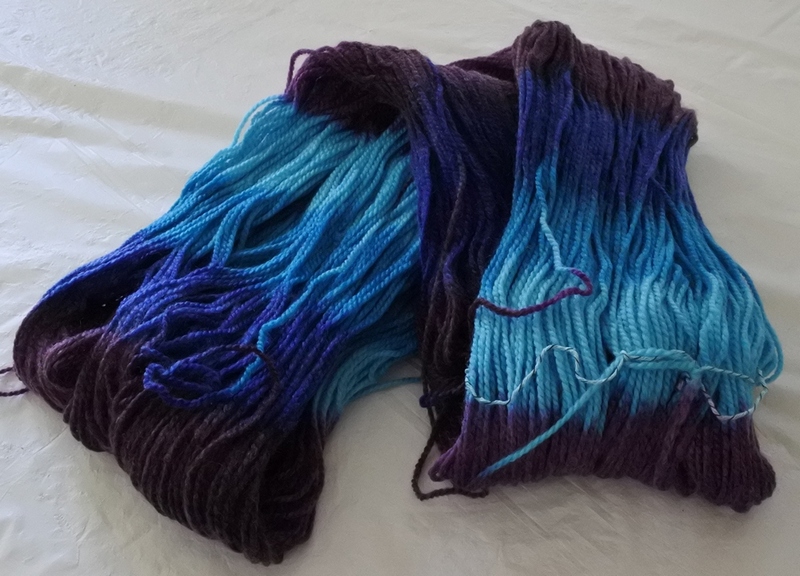 As I mentioned at the very start of this blog I’m a long-time knitter, but I got tired of how long knitting took. Not because I don’t love knitting, but because I was mostly weaving for charities, my inability to wear wool limiting the scope of knitting for myself. This meant I did have a small stash of yarn when I started weaving. What I hadn’t realised is that I had quite a few more stash balls hiding in a bag next to my couch! Well, it’s mostly part-balls and mostly 12ply, but there were some lovely red mohair leftovers and unused balls of a nice blue cotton too. Oh, and some ribbon yarn. I’ve never met a yarn-crafter who doesn’t have a slightly obsessive relationship with buying yarn. Most of us practice abstinence (i.e. yarn shop avoidance) as the only cure to this problem, to varying degrees of success. This was something I was discussing recently with a friend who isn’t a yarn-crafter at all and she put it in a way that I thought was kind of lovely. She said that buying lovely yarn was like buying little balls of hope. That hope is that we will achieve happiness through owning/working with the yarn. I think that’s true. 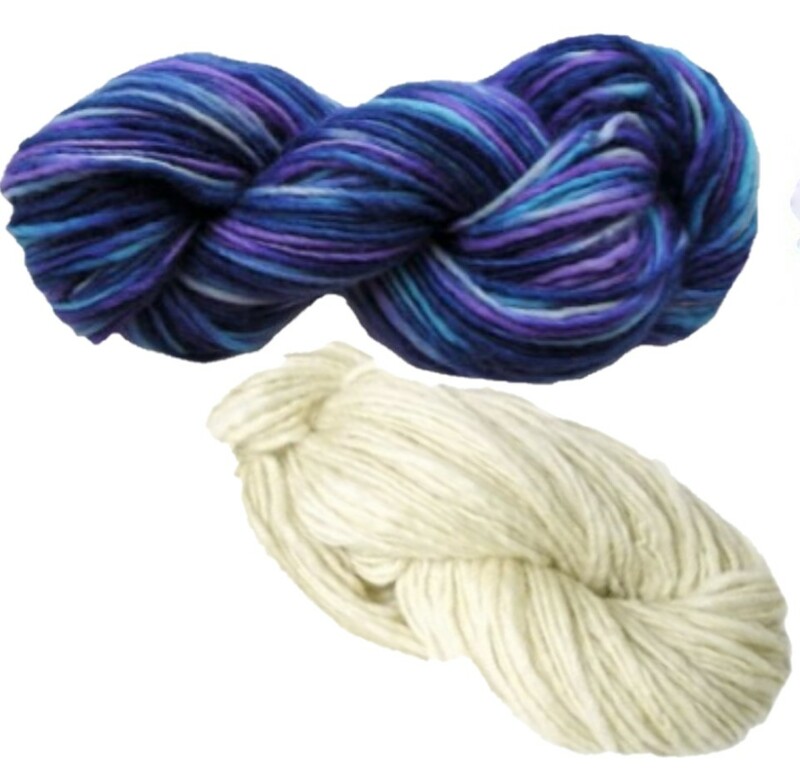 Most yarn-obsessives I know take pleasure in both the actual yarn (colour/texure) and in the ideas for what to make from it. As long as you don’t fall into true hoarder territory where the yarn starts to take over your life, I think that’s probably fine! It is well known to those yarn-ologists who study the secret habits of yarn, that balls of any kind of yarn like to roll. If they can roll off a table and onto a floor so much the better! Since I began weaving I have to say that dressing a loom and winding shuttles just seem to encourage the cheeky blighters. So, how to tame balls of yarn? Based on a suggestion by a friend to try capturing them in a plastic bag, I decided to take a cloth bag and one of those coat-hangers with the strap holders, to create a magical hanging enclosure. By putting each of the cloth bag’s handles onto a strap holder, you get an ever open – but not too wide – yarn trap. It allows for easy hanging on door knobs and chair backs, with relocation as simple as can be. The balls of yarn can’t jump high enough to escape (and I think maybe the dark interior calms them).